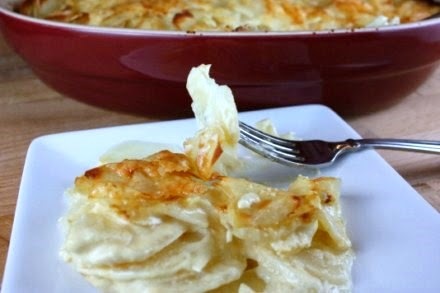 I grew up on scalloped potatoes, my Mother usually served these on a special occasion or for a holiday dinner. Although they were good, it was always a little bit of a guessing game if the potatoes were going to be evenly cooked or even worse, was there going to be a bite that had a little uncooked flour pocket. This happened because the raw potatoes were layered in a dish before baking. When I came across this method from America's Test Kitchen, I immediately thought...."why didn't we think of that?" If we only knew than what we know now, I bet we would have made scalloped potatoes more often. This recipe and method is fool proof and is an absolute winner. The potatoes are creamy, evenly cooked and go perfect with a roast. I hope you give this recipe a try next time you make Scalloped Potatoes. This recipe can also be made a day in advance before baking in the oven. Just be sure it's a room temperature for 2 hours before baking. For the fastest and most consistent results, slice the potatoes in a food processor. 1. Melt butter in large pot over medium-high heat until foaming subsides, about 1 minute. Add onion and sauté until it turns soft and begins to brown, about 4 minutes. Add garlic and sauté until fragrant, about 30 seconds. 2. Add cream, milk, thyme, bay leaves, salt, pepper, and potatoes and bring to simmer. Cover, adjusting heat as necessary to maintain light simmer, and cook until potatoes are almost tender (paring knife can be slipped into and out of center of potato slice with some resistance), about 15 minutes. 2. Remove and discard thyme sprigs and bay leaves. Transfer potato mixture to a large casserole dish and sprinkle with cheese. Bake until cream has thickened and is bubbling around sides and top is golden brown, about 25 minutes. Cool for 5 minutes before serving. Tip: When the potatoes were cut thicker than ⅛ inch, they slid apart when served. Yet when cut much thinner, the layers melted together, producing a mashed potato-like texture. At exactly ⅛ inch, the potatoes held their shape yet remained flexible enough to form tight, cohesive layers. Although it is possible to cut ⅛-inch slices by hand, it is far easier and faster when using a food processor or mandolin.